American statesman Sen. George J. Mitchell will return to Syracuse University on Tuesday, Nov. 12, to discuss prospects for global peace and how (or if) the world has changed in the 25 years since the Dec. 21, 1988, bombing of Pan Am 103 over Lockerbie, Scotland. The bombing killed 270 people, including 35 students returning from a semester of study abroad through SU. “Pan Am 103 and Our World 25 Years Later,” a conversation between Mitchell and Maxwell School of Citizenship and Public Affairs Dean James Steinberg, will begin at 5:30 p.m. (a change from the previously announced time) in Hendricks Chapel and is part of the University’s commemoration of the 25th anniversary of Pan Am 103. The lecture is free and open to the public. American Sign Language (ASL) interpretation and Communication Access Real Time (CART) will be available. Reduced-rate parking is available in Irving Garage. The lecture is sponsored in collaboration with the University’s Pan Am 103 25th Anniversary Commemoration Committee, the Office of the Chancellor; the Whitman School of Management; the School of Education; and Hendricks Chapel. A highly respected senator, Mitchell became Senate Majority Leader on Jan. 3, 1989, two weeks after the Pan Am 103 tragedy. He has also been a special envoy for Middle East peace (2009-11) and for peace in Northern Ireland. In early October 2001, less than a month after the 9/11 terrorist attacks, Mitchell opened the University Lectures series by calmly and honestly addressing the attacks during his lecture. Mitchell was appointed to the United States Senate in 1980 to complete the unexpired term of Sen. Edmund S. Muskie of Maine. He was elected to a full term in the Senate in 1982, and went on to an illustrious Senatorial career spanning 15 years. In 1988, he was re-elected with 81 percent of the vote, the largest margin in Maine history. Within his Senate tenure, during which time he garnered bipartisan respect, Mitchell served on the finance, veterans affairs and environment and public works committees; led the successful 1990 reauthorization of the Clean Air Act; and was the author of the first national oil spill prevention and clean-up law. Mitchell led the Senate to passage of the nation’s first child care bill; was principal author of the low-income housing tax credit program; and was instrumental in the passage of the Americans with Disabilities Act. Mitchell’s efforts led to the passage of a higher education bill that expanded opportunities for millions of Americans. He was a leader in opening markets to trade and led the Senate to ratification of the North American Free Trade Agreement and creation of the World Trade Organization. He left the Senate in 1995 and served as a special advisor to President Bill Clinton on Ireland. From 1996 to 2000 he served as the independent chairman of the Northern Ireland Peace Talks. Under his leadership, the Good Friday Agreement, an historic accord ending decades of conflict, was agreed to by the governments of Ireland and the United Kingdom and the political parties of Northern Ireland. For his service in Northern Ireland, Mitchell received numerous awards and honors, including the Presidential Medal of Freedom, the highest civilian honor given by the U.S. government; the Philadelphia Liberty Medal; the Truman Institute Peace Prize and the United Nations (UNESCO) Peace Prize. 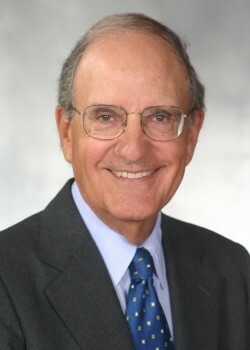 In 2000 and 2001, Mitchell served as chairman of an International Fact-Finding Committee on violence in the Middle East. The committee’s recommendation, widely known as the Mitchell Report, was endorsed by the Bush Administration, the European Union and by many other governments. In 2006 and 2007, he led the investigation into the use of performance enhancing drugs in Major League Baseball. He also served as chairman of the Special Commission investigating allegations of impropriety in the bidding process for the Olympic Games, and was the independent overseer of the American Red Cross Liberty Fund, which provided relief for 9/11 attack victims and their families. In 2008, Time magazine named Mitchell one of the 100 most influential persons in the world. The George J. Mitchell Scholarship is given annually by the U.S.-Ireland Alliance to 12 Americans ages 18-30 to fund one year or graduate study in Ireland. The scholarship is one of the most selective in the United States. The University Lectures series is now in its 13th year. During the spring 2014 semester, guests will include MSNBC host Chris Hayes, “Twilight of the Elites” (Tuesday, Feb. 25 at 7:30 p.m.); New Yorker cartoonist and author Roz Chast, “Theories of Everything and Much, Much More” (Wednesday, March 5 at 7:30 p.m.—a change from the previous announced date); actress and playwright Anna Deavere Smith, “Snapshots: Portraits of a World in Transition” (Tuesday, March 25 at 5 p.m.); and education advocate and author Diane Ravitch, “The Death and Life of the Great American School System” (Tuesday, April 1 at 7:30 p.m.). The Office of University Lectures welcomes suggestions for future speakers. To recommend a speaker, or to receive additional information about the University Lectures series, contact Esther Gray in the Office of Academic Affairs at 443-2941 or eegray@syr.edu. More information can be found at http://lectures.syr.edu or on Facebook at https://www.facebook.com/#!/universitylectures.